Looking for answers regarding roofing installation or how it will take to install new windows for your home? We answer questions about our core services, installation process and more. Since 1978, Adelphia Exteriors has been the solution for thousands of Northern Virginia homeowners when it comes to remodeling their home. Click on the tabs below for product specific answers to common questions we are asked by homeowners. Do you provide free estimates on roofing and windows? Yes! We provide free estimates on replacement windows, residential doors, and gutter replacement services. Our licensed home improvement experts at Adelphia Exteriors have been around for over 30 years, giving you peace of mind that your home improvement project will be done the right way the first time. We also provide free estimates roof restoration service and replacement. With a careful inspection of your roof, we offer you a wide variety of options, colors, and materials to protect your home against the unique Northern Virginia climate. How can I find Adelphia Exteriors reviews and ratings? Since we’ve been in business since 1978, we have thousands of happy customers all around the Northern Virginia area. Visit our testimonials page to see what our customers have to say about our window and door installation, roof replacement and gutter services. Adelphia Exteriors is proud of their A+ rating with the Better Business Bureau as well as high ratings on Google, Yelp, Angie’s List and Facebook! Click on any of the links below to see our ratings and what our happy customers say about us. How much will it cost to remodel my home? Your home remodeling project could consist of several conditions which affect the installation price as well as the type of materials needed for the job. There are many variables that go into pricing the exterior and interior work on your home. Once the experts at Adelphia Exteriors meet you at your home to discuss your replacement front door project or your residential window replacement project, we will give you an estimate at no charge with a great warranty and no pressure sales approach! How long does it take to shingle a roof? Roof replacement could take anywhere from one day to several days or more depending on many different factors such as the size of your home, the complexity of the project and of course the weather! 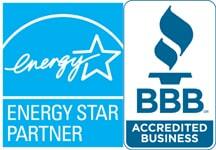 Since 1978, Adelphia Exteriors has been Northern Virginia’s leader in residential roofing services. With thousands of happy customers, you can rest assured that your new roof will be installed by licensed professionals, handled with care and improve the look and value of your home! What are the different types of windows you offer? We offer many different types of residential replacement windows made from high-quality materials and backed by an incredible warranty. How long does a window installation take? A replacement window installation can take anywhere from a few weeks to a couple months, depending on when you placed your order until your windows arrive. With a standard window replacement project where only a few windows are needed, you can expect a shorter time frame. On installation day, the time it takes to complete your project depends on the type of windows you purchased and a number of windows being installed. What's the difference between double pane and triple pane windows? A standard double pane window from Adelphia Exteriors reflect 90% of the energy and only lets 10% into your home. That means on a nice summer day outside, you can expect 90% of the heat from the sun is going to stay outside, and only 10% will come into your home.. In comparison, a typical triple pane window increases to 97% of energy and only allow 3% to pass through to your home. Triple pane windows also can cost up to 30% more than double pane windows, it makes sense to go with double pane windows if you’re looking for the best deal up front. Homeowners who choose triple pane home windows choose them for the comfort and noise reduction. If comfort is your biggest concern, triple pane windows may be the best option for your home. The extra pane of glass in a standard triple pane window makes it an ideal option for keeping noise out and keep more of the extreme weather out of your home. Yes! Residential window replacement can improve your home’s value, increase the comfort of your home instantly and save you money every month on your energy bill. In the long term, you’ll recoup most of the cost on your home’s market value and you will save money every month! All factors to consider when researching window replacement companies. Adelphia Exteriors is a family-owned, local window company which is highly rated and has thousands of happy customers. Since 1978, the experts at Adelphia Exteriors have thrilled homeowners with a great product, easy process, and hassle-free installation. See what all of our customers have to say about us! How long does window and door installation take? The ordering process could take anywhere from 2 weeks to a couple months, depending on the scope of the project as well as the materials, designs, and sophistication of the project. The actual window and door installation can take anywhere from one day to a few days, depending on the scope of the project. For example, if you’ve ordered a large number of replacement windows, the amount of time to install could take a couple days. If you ordered one door or a few windows for your home in Burke, VA, this will only take a day to complete. What's the difference between fiberglass and steel doors? When it comes to the energy efficiency of your home, replacement entry doors made of fiberglass usually offers more cold weather advantages. Steel can sometimes be a poor insulator. If it’s cold outside, you will be able to feel it on the inside of most steel doors. Replacement doors made of steel are usually the least expensive option compared to fiberglass entry doors. Nowadays, both replacement steel and fiberglass entry doors are both aesthetically pleasing and give your home curb appeal you desire. Do you have style options for your entry and front doors? Yes! We offer many different styles and options for entry door replacement, sliding glass doors and French doors. Our experts at Adelphia Exteriors will review all the different options with you when we visit your house for a free estimate. We will walk you through the process, show you all the options you have and schedule your door installation project right there! Should I replace or repair the siding on my home? Depending on the damage of your siding, it is possible to repair the siding without replacing the all the siding on your home. Siding repair is often the option we recommend the least as it can cause energy efficiency issues, can be aesthetically unappealing and may not capture the root problem when it comes to protecting your home. Repair also may not be the best option depending on the material. For example, if you have slate or wood siding, we’d recommend going with a sturdier, more energy efficient option such as Vinyl Siding. When you call Adelphia Exteriors, our experts will review the siding on your house with you, go over all your options and give you the best recommendation for completing the siding project. We walk you through the replacement siding installation process and schedule a date for the project completion. How long does siding installation take? With home remodeling projects such as siding replacement, it depends on several different factors such as the size of your home, the type of material you have chosen and other various options such as color, style, and size. Residential roof replacement is a project that is labor-intensive and can take anywhere from a one day to a few days or more depending on the size of your home, the complexity of the project and the availability of the product you ordered. Completion of the project can also be affected by the weather, as well. When scheduling your roof restoration service through Adelphia Exteriors, you’ll receive a free estimate on what the project will cost, you’ll be able to choose between many different options and styles, and our experts will walk you through what residential roofing service process from start to finish. What type of financing for roof replacement do you offer? We offer several different financing options to fit your budget when you work with Adelphia Exteriors for residential roofing services. At Adelphia Exteriors, our number one goal is for our customers in Northern Virginia to be totally satisfied with their roof restoration project upon completion. How to pick a roofing contractor? We highly recommend looking at past customer reviews on Google, Angie’s List and Facebook for any local roofing contractor you are thinking about doing business with. Research what past customers have said about their experience and look at their website for a variety of product offerings. When doing research online, be aware of scammy reviews from disgruntled employees or competitors. We highly recommend looking at multiple websites in order to get the full picture of the roofing contractor you are considering for your roof replacement project. Unfortunately, the roof replacement industry is saturated with unlicensed and uninsured contractors. Make sure your roofing contractor is professionally licensed and insured by asking for their license when you meet with them to discuss your roofing project.